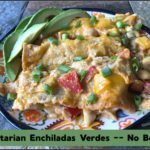 Vegetarian Enchiladas Verdes -- No Beans! 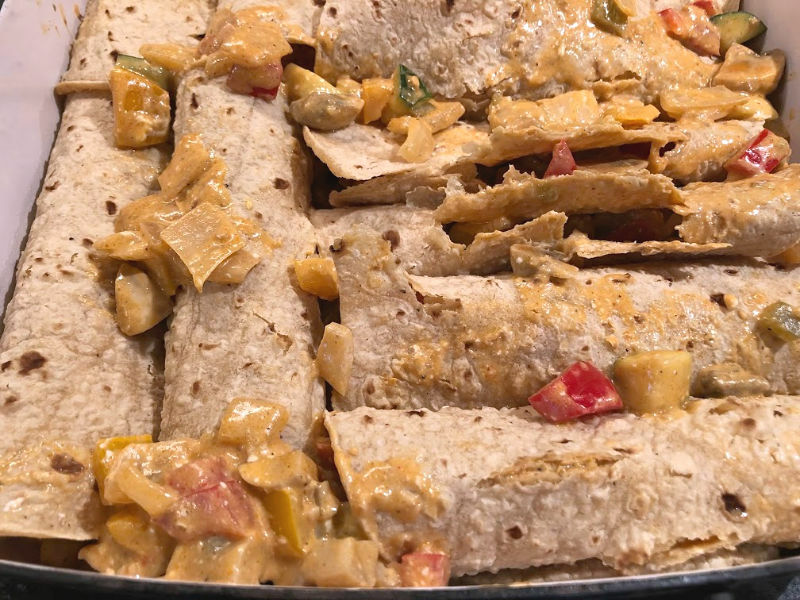 Vegetarian Enchiladas Verdes pack plenty of veggies and cheese into corn tortillas in this hearty veggie enchiladas recipe — with no need for beans! 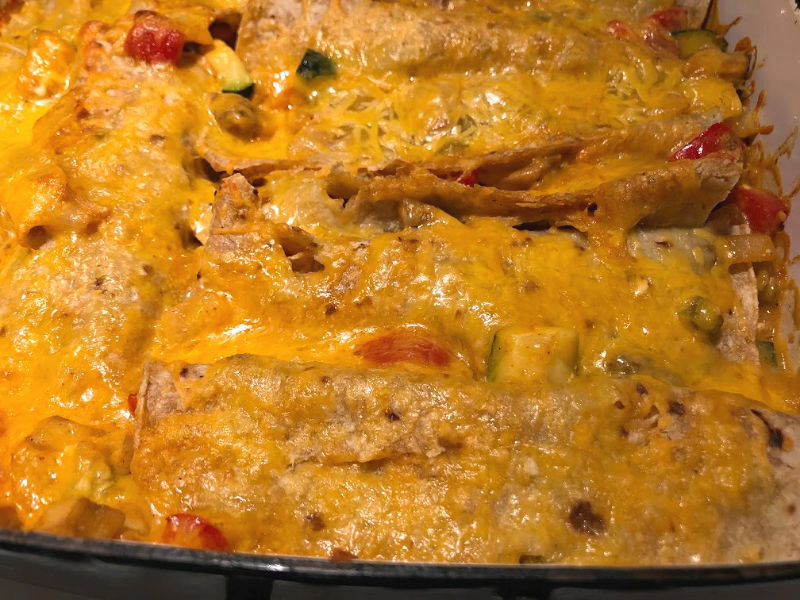 Since yesterday’s recipe already incorporated beans & corn, I also thought it might be fun to switch things up the next day with some different bean-free, veggie-packed vegetarian enchiladas. Here, mushrooms provide that savory, hearty chewiness you’re looking for, and you get your protein from the cheese + cream cheese. 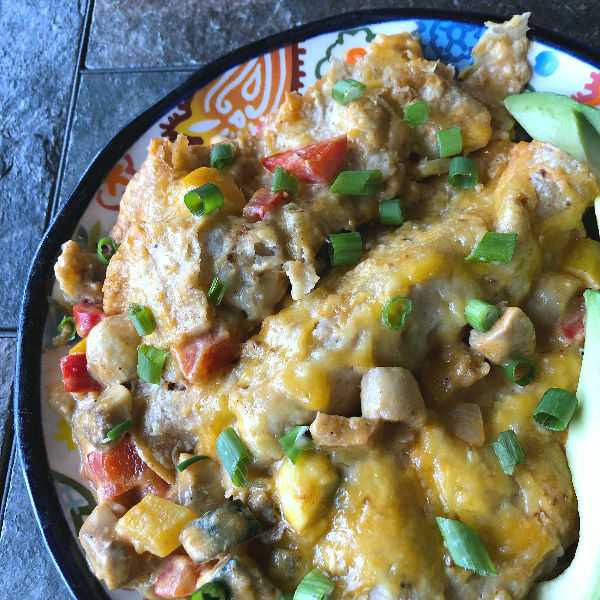 Easy, cheesy, and veggie-full, this veggie enchiladas recipe is a great Meatless Monday or Taco Tuesday alternative. Looking for more vegetarian recipe ideas? Take a few minutes to browse through the Meatless Monday category for additional dinner options. Take cream cheese out to soften and chop it into smaller chunks. Preheat oven to 375 degrees, and spray a 9×13 baking dish with cooking spray. Chop the onion and bell pepper. 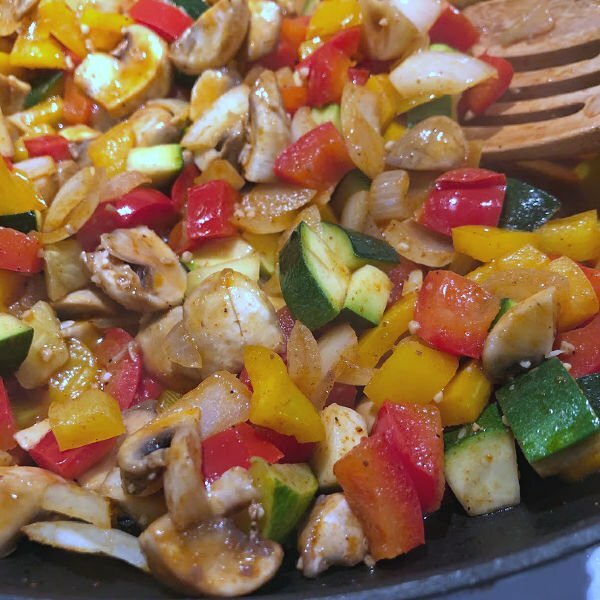 Add zucchini, mushrooms, and garlic to the skillet. Season the veggies with cumin, smoked paprika, sea salt, and chili powder. Continue to saute over medium heat for another 9-10 minutes, stirring occasionally, or until mushrooms are softened. Reduce the heat under to the pan to low. 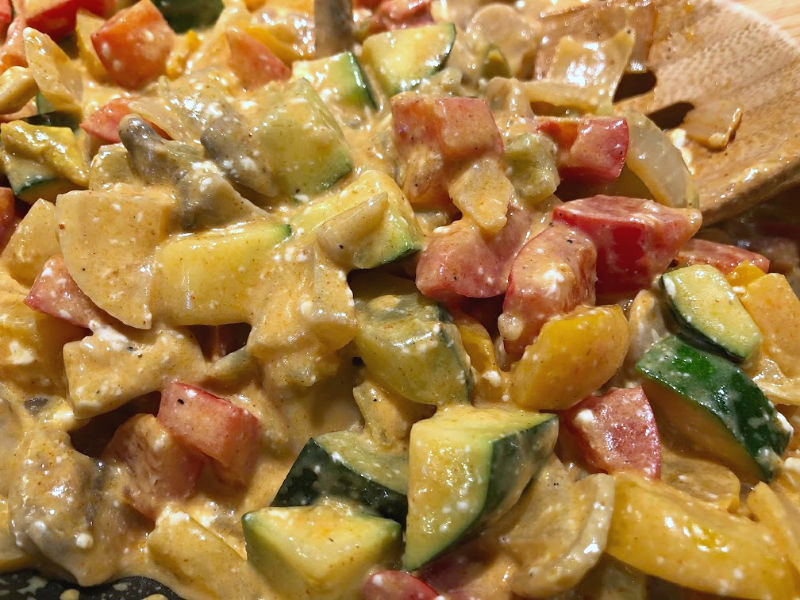 Stir in chopped green chiles, cream cheese, 1/2 cup cheese, and 1/4 cup of enchilada sauce, until the cream cheese is melted and incorporated into the veggie mixture. Warm tortillas briefly in microwave to make them more pliable, and drizzle 1/4 cup enchilada sauce across the bottom of the prepared baking dish. Spread some enchilada veggies down the middle of each tortilla. Roll each up, and place it seam side down in the baking dish. If you end up with a little extra filling, just spoon it around the enchiladas in the pan. Drizzle the remaining cup of enchilada sauce across the top of the enchiladas. Top everything evenly with the remaining shredded cheddar. Bake uncovered at 375 degrees for 20 minutes, then broil for two minutes on high to brown the cheese. Let enchiladas cool for a few minutes before serving. Garnish your veggie enchiladas with chopped cilantro or green onion, and serve with sliced avocado (optional). … because that’s what cheese and sauce is for! Note: Don’t worry if your tortillas tend to crack or if the filling spills out the ends. You’re eating these with a fork, anyway, and enchiladas are about taste, not about beauty. I can’t create a beautiful dish of tightly rolled, perfect enchiladas to save my life, but shredded cheese and sauce can hide a multitude of sins. Check out my before and after photos here, and you’ll see what I mean. These vegetarian enchiladas go really nicely with some sliced avocado for a filling weeknight dinner. Next time I might throw a little spinach in there too, if I can find the room for it — but they’re super flavorful just as they are. 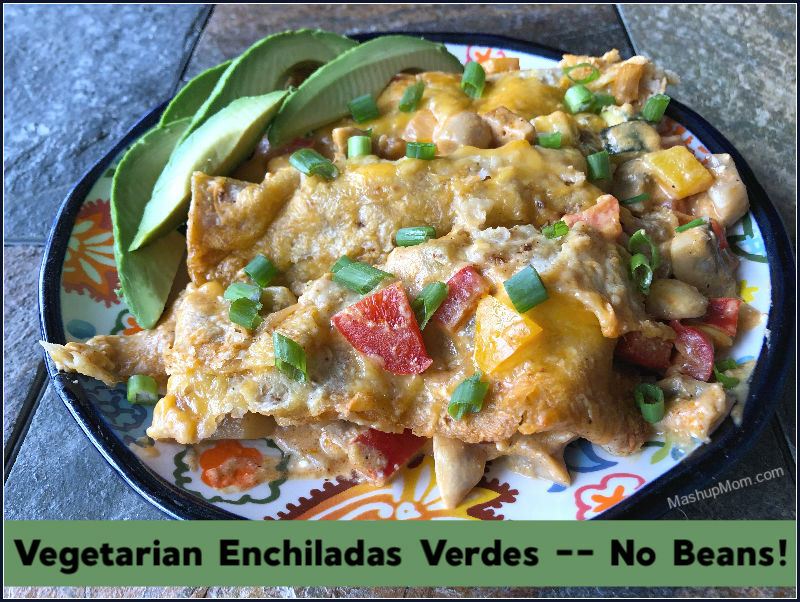 Vegetarian Enchiladas Verdes pack plenty of veggies and cheese into corn tortillas in this hearty veggie enchiladas recipe -- with no need for beans! Take cream cheese out to soften and chop it into smaller chunks. Preheat oven to 375 degrees, and spray a 9x13 baking dish with cooking spray. Chop the onion and bell pepper. Don't worry if your tortillas tend to crack or if the filling spills out the ends. You're eating these with a fork, anyway, and enchiladas are about taste, not about beauty. I can't create a beautiful dish of tightly rolled, perfect enchiladas to save my life, but shredded cheese and sauce can hide a multitude of sins. Check out my before and after photos here, and you'll see what I mean. These were amazing! Can’t wait to make them again. We get something like this at the Mexican rest. They minus the cream cheese throw in protein and serve it over Mexican rice. I always get just veggiesor sometimes shrimp. The actual plate comes with chunks of steak, chicken and shrimp. You can just add any protein tofu would be great as well. Thanks for the cream cheese idea. I will be making it soon. It’s around 12.00 or 13.00 a plate but two people could share it. Oh my!!! This is amazing!!! I love this thank you for doing some meatless meals!! I try to eat mostly plant based food so I modify some of them for myself and make it the way you write it for the family…. This was perfect!